Freshman phenom Gabrielle Thomas of Harvard has extended her dominance to the field events in the long jump. In her long jump season opener at the Harvard-Yale Meet, Thomas jumped 19’4” to co-win the event with her teammate Allison Morrison. Morrison’s mark is considered wind-aided. The teammates share the furthest distance in the conference this year. Harvard has two more athletes ranked in the top 10 – rookie Bola Hambolu and heptathlete Madison Hansen. Cornell’s Claudia Dabrowski comes into the meet claiming the third overall position a wind-legal mark of 18’11.75”, which is a career best for the sophomore. Brown’s O’Sha Williams is looking to score in both horizontal jumps as she has a top 6 mark of 18’9”, recorded at the Brown Springtime Open. Ariel Becker at Princeton is also in the running to claim a spot on the podium as she’s jumped a lifetime best of 18’5” at the Princeton Outdoor Invitational. The women’s triple jump is slated to be a loaded competition as four competitors have jumped over 12m (39’ 4.75”) since the beginning of the season. Leading the pack is Williams of Brown, who has continued to show improvement throughout each competition. At the UVA Challenge she posted a mark of 41’10.05”. Brown’s Williams is only a half an inch ahead in the conference rankings of Columbia’s Anna Williams with her 41’10” distance. Also jumping over the 12m threshold is Adetunke Sonaike from Columbia as her 39’9.25” leap puts her in third going into the championship meet. Columbia also has a third potential scorer in Alexis Yeboah-Kodie. 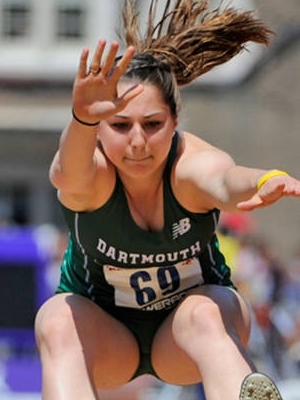 Molly Shapiro of Dartmouth has had an impressive outdoor season, setting season bests en route to her 39’5” jump at the 2016 Dartmouth Outdoor Invitational. Cornell’s Gaynelle Boham is also a contender in the triple jump competition with her 39’2.5” jump. This entry was posted on Thursday, May 5th, 2016 at 7:00 am. It is filed under Heps Champs, Spotlight, Team Previews, Women. You can follow any responses to this entry through the RSS 2.0 feed.